The contents of the book describe the many examples of the types of characters and crazy daily episodes that an average person who selects a career in casino hotel management will witness and are part of during a lifetime in such a career. 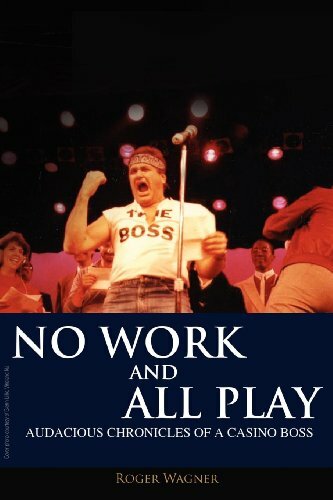 The book is really not about me, but it is a lifetime chronicle of my career where every work day is fun and there is almost never any drudgery. The three most interesting characters in the book are none other than a tycoon named Donald Trump, a Casino Icon named Jack Binion and a baseball ledged named Mickey Mantle. The book also describes many other very interesting real-life persons in my career from Mob-connected people to other well known casino operators of their day. Most of these characters are not famous celebrities but their stories are sometimes even more humorous than those of Trump or Mantle. The stories about these people are real and actually happened, although the actual dates may be incorrect in some cases and some of the intricate details may be embellished to improve the stories. None of the tales degrade any of the characters in my book, but I do tell humorous stories about all of them that demonstrate they all have to put their pants on one leg at a time like the rest of us. It is not a text book, but it can serve as a good primer for a person considering making gaming hospitality their career objective. The seven different sections of the book are written to show how a person entering a casino hospitality position might evolve from the lowest level in a casino organization to a very high level of management, and that it generally takes many years to accomplish. It also describes the different relationships that one develops in any type of business and I use real people to illustrate how they each fit into the different types of relationships. The cover is interesting enough to draw some readers in. The plot line is fun to read, many readers enjoy reading about other peoples' lives. The author has a very descriptive writing style that will help the reader picture the events and characters. As the author stated above, while the characters may not be famous or infamous, their stories are still very entertaining. The reader will have varying reactions to the different characters, some he/she will just want to laugh at while others may repulse him/her. There is also an abundance of gaming hospitality information. If one is interested in that subject or field of work, this is a great book to read. The author writes from personal experience, giving the reader that inside look and feel. The reader will be introduced to different types of relationships, business and otherwise. The author demonstrates that it takes hard work to do well in this field of work. This book is a fun read, there are many stories that will make the reader laugh out loud. It isn't a hard book to finish, between the humorous tales and the serious inside information the reader won't want to put the book down for long. This book is recommended to adult readers.